The American Pit Bull Terrier is a powerful looking dog with a brick-like head and strong muscular jaws. 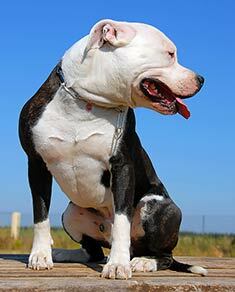 American Pit Bull Terriers are generally very muscular and stocky, yet agile, and extremely strong for their size. 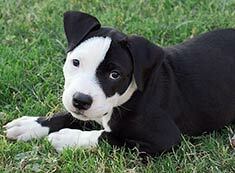 American Pit Bull Terriers are a multicolored, black and white coat. American Pit Bull Terriers have thick, short, shiny hair. Brush regularly with a firm bristle brush. A rub with a piece of toweling or chamois will make their coat gleam. Good natured, loyal and affectionate, the American Pit Bull Terrier has been known to be aggressive towards other dogs; however this can be avoided with proper training. American Pit Bull Terriers when properly socialized do well around children and make great family pets. They are obedient, eager to please, courteous and intelligent and make great guard dogs. The American Pit Bull Terrier is a generally healthy breed. Some known problems are hip dysplasia, hereditary cataracts and allergies to grass. The American Pit Bull Terrier can be expected to live about 12 years. A home with a fenced yard is recommended. 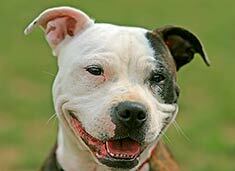 American Pit Bull Terriers are very energetic, and not a great choice for a first time owner. Perhaps no other dog in history has been the subject of so much controversy as the Pit Bull. In truth, the name Pit Bull covers a large number of individual breeds, all lumped together based on their appearance and tendency towards aggression. This is not to say that all Pit Bulls are aggressive, however. Properly cared for, trained, and socialized, the Pit Bull can be an amazing companion. Some have even been used as assistance dogs and therapy dogs with great success. Pit Bulls can be wonderful pets for responsible owners--they don't deserve their bad reputation. The breeds most often called Pit Bulls are the American Pit Bull Terrier, the American Staffordshire Terrier, and the Staffordshire Bull Terrier. There are several other lesser-known breeds which are loosely grouped into the term "Pit Bull", including the Perro de Presa Canario, the Cane Corso, and the Dogo Argentino. The ancestry of the pit bull is from the bulldogs and terriers of England, where terriers served such an important function that each county had its own breed of terrier. These dogs were used to kill vermin that would otherwise spread diseases such as the Black Plague. In addition, vermin were also known to ruin crops and damage property, so the terrier was kept quite busy. The bulldog, meanwhile did exactly what the name implied - he herded bulls. When a farmer needed to bring a bull in from the field for castration or slaughter, it was not unheard of for the bull to gore the farmer. (Go figure! Maybe they knew what was coming!) The bulldog would bite the bull's nose and tenaciously hold on until the bull left the farmer alone. As is often the case, sporting contests grew around the required work. Just as cowboys compete in rodeos, English terriers and bulldogs competed in competitions meant to show off their skills, being baited by rats and badgers for the terrier, and by bulls and bears for the bulldogs. Parliament soon banned the practice as inhumane, and those ever-inventive Brits turned to dog-fighting as a pastime. The bulldogs weren't particularly interested, so they were bred to English White terriers or Black and Tan Terriers to produce the Staffordshire Bull Terrier, a strong, tenacious dog, capable of fighting for the pleasure of his owners. It should be noted that the goals pursued by selective breeding were intelligence and non-aggression towards the handler and fight referee. Both qualities are displayed in present-day Pit Bulls. With the massive immigration of Irish and English into Boston during the mid-1800's, many Staffordshire Bulls were brought to the United States, where they were bred to be larger and stockier. This new breed came to be known as the American Pit Bull Terrier and was soon quite popular. Pete the Pup was featured in Our Gang, which evolved into The Little Rascals. The dog even appeared on the cover of Life magazine three times, more than any other breed. In the late 20th century, Pit Bulls became the breed of choice for drug dealers and other illegal enterprises, both as a status symbol and as a means of protection. Rather than socializing the dogs as pets, these dogs were specifically bred and trained to be aggressive. To make money off of the dogs, the owners often turn to gambling on dog fights. Because this type of owner is not particularly concerned with being responsible, pit bulls are often not contained properly to prevent injuries to others. The Centers for Disease Control estimates that as many as one-third of fatal dog attacks are due to Pit Bulls. This has resulted in a number of cities and states within the U.S., as well as many other countries, banning any dog that looks like it may have Pit Bull heritage. Urban legends abound regarding Pit Bulls. Some say their jaws lock shut on their prey, but studies have shown that the jaw structure and function of a Pit Bull is no different than that of any other dog of its size. Other stories say that Pit Bulls are unable to feel pain, which is why pepper spray or other pain-inflicting devices are ineffective in stopping a Pit Bull attack. It isn't that the dog can't feel pain, it is that he has been bred and trained to finish his task in spite of the pain. Pit Bulls who are responsibly bred, trained and socialized can indeed make good pets, in spite of the additional insurance most owners in the United States are required to carry if they own one of these dogs. Celebrities such as Jessica Biel, Rachael Ray, and Jon Stewart own Pit Bulls, as does Cesar Millan, The Dog Whisperer. Pit Bulls have even been nicknamed "nanny dogs" for their propensity to adopt orphaned animals such as kittens and baby squirrels. There are numerous stories of heroic Pit Bulls, including Chief, who in 2007 dashed in front of a spitting cobra to save his family. The dog was able to prevent the snake from hurting the humans, but died later from the dose of venom he received. Due to the breed's high energy and intelligence, they make great working dogs, often being used in search and rescue as well as for drug-sniffing operations. Dakota, a Pit Bull from California was used to search for Laci Peterson after her disappearance and for the remains of the Space Shuttle Columbia's crew after the explosion. Popsicle, a Pit Bull used by the United States Customs Service, was involved in one of the biggest cocaine busts in history. Incidentally, Popsicle received his name when he was rescued from a freezer where he had been left to die after serving as a bait dog to train fighters. Norton, another dog rescued from the fighting ring, saved his mom's life when she went into anaphylactic shock after a spider bite. The dog nudged the woman's husband until he woke up to assist his wife. It is a tribute to the intelligence of the breed that so many dogs rescued from the fighting ring can be rehabilitated as pets. Of the nearly 50 Pit Bulls taken from Michael Vick in 2007, only one had to be euthanized due to its aggressive tendencies. About half of the dogs required rehabilitative behavior training, while the remainder were deemed suitable for adoption immediately. If you are thinking about adopting a Pit Bull, you must make sure you are worthy of the task. Early obedience training is essential, as is keeping the dog supplied with work or play that makes use of his high energy level and intelligence. Before you adopt, make sure you know your local laws and insurance regulations concerning this breed, as your expenses may be quite a bit higher with a Pit Bull than with other breeds who do not have such a bad reputation. Find American Pit Bull Terrier Puppies with our Free Breeder search!